Flower exports were dispatched from Bogota, Medellin and Quito with Puerto Rico, Los Angeles and Miami (United States) as a final destination, where the Airline has a logistics operation center and the necessary infrastructure to receive and process up to 786 tons of flowers per day. 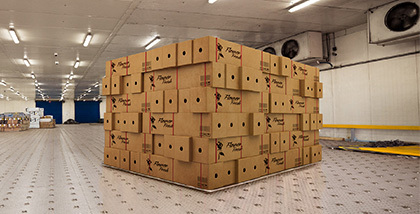 According to Victor Mejia, Avianca’s Cargo Vice President, “the company has been working on the adaption of processes in order to adjust to the needs of the flower growers. Therefore, we have been able to ensure a prompt and adequate delivery of a large variety of floral species, such as roses, carnations, chrysanthemums and hydrangeas”. In order to ship the flowers, Avianca operated a total of 183 flights using specialized cargo airplanes with a capacity between 40 and 100 tons per flight. To satisfy the exporter’s needs during the season, the company used Boeing 767-200, Boeing 747- 200F and Boeing 747-400F aircraft for this service; they were complemented with Airbus 330F which are part of the Avianca Cargo fleet and have special compartments and temperature control systems which are essential to care for these types of perishable goods. Additionally, during this season Avianca Cargo operated 13 charter flights, eight bound for Miami, four to Los Angeles (United States) and one to San Juan (Puerto Rico). “With a season as successful as this one we proved that Avianca Cargo is prepared to efficiently respond to market demands in the flower export industry. We are very pleased to know that year by year we move forward and in sync with our clients”, expressed Avianca’s Cargo Vice President.